The following article was published (in Danish) in: Sturtewagen, Isis (2007), En kruset hoveddug; Catherine de Beauchamps hovedtøj. (A Frilled Veil; The Headwear of Catherine de Beauchamp) In: Peter Vemmning (ed. ), Middelaldercentrets Nyhedsblad, vinteren 2006/07, pp. 20-21. Nykøbing: Middelaldercentret. In May 2006 I was invited by Camilla Luise Dahl from the Middelaldercentret in Nykøbing, Denmark, to research the background to the quite remarkable veil worn by Catherine de Mortimer on her burial tomb. I have been supplied with detailed photos of the tomb by Catherina Oksen, an archaeologist connected to the Middelaldercentret. Catherine Mortimer was born ca. 1314 in Wigmore, Herefordshire, England. When she was fourteen years of age she married Thomas de Beauchamp, 11th Earl of Warwick. 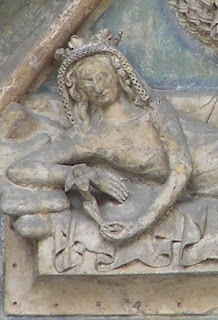 Catherine died c. 1370. 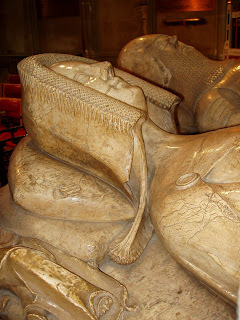 She was buried in a tomb, dated c. 1370-1375 in St. Mary's Chapel, Warwick, England, together with her husband. The tomb shows Catherine wearing a frilled veil, which consists of two elements: one twelve layered veil with a 'checker' or ‘honeycomb’ pattern and a single layered veil with small rounded pleats or frills on top (Fig. 1). The sides of the tomb are decorated with both male and female mourning figures of which the female figures also feature the ‘honeycomb’ veils. They consist of fewer layers (three to four) and are rendered more stylized and less realistic than Catherine’s veil. The face of Catherine De Beauchamp, countess of Warwick, enclosed in a frilled veil, featuring a fine lattice pattern, c. 1370-1375. Tomb of Catherine De Beauchamp, countess of Warwick, St. Mary's Church, Warwick. Photo: Catharina Oksen, by permission. At least a dozen of other examples of this same type of headwear can be seen in contemporary artwork. The earliest known example of the honeycomb-pattern in headwear is dated to 1356. On the western north-portal of the Münster in Ulm, Germany, we can see Saint Mary wearing a veil consisting of three layers of fabric somehow attached onto each other. (Fig. 2)Other examples of this type of veil construction can be seen on sculptures in England, Flanders, Germany and Denmark. The Virgin Mary wearing a honeycomb veil consisting of three layers of fabric, 1356. The western north-portal of the Münster in Ulm, Germany. Photo: Isis Sturtewagen. This type of frilled headwear, as discussed above, is often believed to be a mere stylisation, and was in reality no more than a pile of fluted fabric layers. Several authors, on the other hand, interpret the honey-comb veil as being a sewn fretwork of layers of fabric. This technique is a method used during the 16th and 17th century for making frilled cuffs and collars. 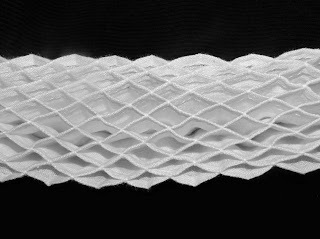 I have experimented with several methods to obtain the 'honeycomb' effect, as well as methods to achieve the single layered frilled veil Catherine wears on top of her fretwork veil. Fretwork can be obtained by sewing several layers of fabric together at one edge in a certain manner. I first experimented with this technique by trying to reconstruct a sample of the veil as it can be seen on the western nord-portal of the Münster in Ulm. (Fig. 3)After that I did several samples of possible variations on the method described above, to achieve an effect similar to the one seen on the tomb of Catherine de Mortimer, and other sculptures showing veils of the same type. A sample of one of the experiments trying to reconstruct Catherine's veil can be seen in Fig. 4. Experimental sample of the veil of Saint Mary as seen on the western north-portal of the Münster in Ulm, Germany. Photo: Isis Sturtewagen. 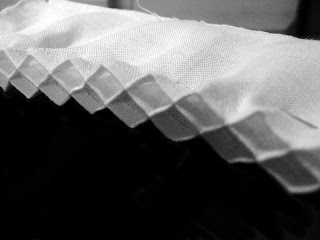 Sample (reconstruction) of a possible construction method for Catherine's frilled veil based on 16th century sewing techniques. Photo: Isis Sturtewagen. A more detailed and thorough report of my research to this subject will be published in the book 'Trimmed with Frills: Crimped, frilled and ruffled edges in women's headwear in medieval and early modern times'. Dahl, Camilla Luise: Kruseler og Krusedug. Herolden, årg. 9, nr. 2, 2005(a), pp. 14-19. Lehnart, Ulrich: Kleidung und Waffen der Spätgotik, teil II. 1370-1420. Karfunkel Verlag Wald-Michelbach, 2003. Liebreich, Anne: Der Kruseler im 15. Jahrhundert. Zeitschrift für Historische Waffen- und Kostümkunde. 1. Band der neuen Folge, Jahrgang 1923 – 1925. Verlag von Walter de Gruyter & Co. Berlin, pp. 218 – 223. Norris, Herbert: Costume and fashion. Vol. 2. Senlac to Bosworth 1066-1485. London: Dent, 1950. Rady, Ottilie: Der Kruseler. Zeitschrift für Historische Waffen- und Kostümkunde. 1. bd, Neuen Folge, Hft. 5. Jahr. 1923-25. Verlag von Walter de Gruyter & Co. Berlin, p. 131-136. Scott, Margaret: A Visual History of Costume: The Fourteenth and Fifteenth Centuries. B. T. Batsford Ltd. London, 1986. Steenbuch, Lene: Et rekonstructionsforsoeg af det krusede lin, kruseler, In: Herolden, årg. 9, nr. 2, 2005, pp. 20-21. Congratulations!!! It is so nice to see the results of your hard work in a "quality" publication! I cannot wait the book with your and all other articles:) Maybe I'll try to do another frilled veil with new technique then? Any idea what happened to the "Trimmed with Frills: Crimped, frilled and ruffled edges in women's headwear in medieval and early modern times" book/publication? I should love to read it!! how it looks now, the articles from this research project will probably be published online, on the middelaldercentret.dk website. i'll post an update on the blog when the time is there.